I've got some big news for you guys. Yesterday, I watched Star Trek. I was not excited. I mean, Star Trek. On the list of movies I couldn't understand or follow, Start Trek was right there at the very top, right after Inception and those movies about magic and just before The Dark Knight (I've probably seen bits and pieces of that one like 20 times, no joke. It continues to cause my brain to implode...every time.) Anyway, I watched it. And get this, folks. I honestly think I understood about 90% of it. It was awesome. It was incredible. It was monumental. Granted, I didn't do this entirely on my own. In fact, I sort of cheated. But it was good cheating. A couple weeks ago, I was at at my aunt's house with my family. My little brothers started watching it. It got about 20 minutes in and already I was confused because first of all, there are these bad guys with a bunch of tats and they don't know what the date is, and then there's this other captain guy and I think he died, but then all of a sudden someone else was the captain? but he wouldn't get off the ship or something and I think he committed suicide, which was weird, but I also think he had a wifey who was about to birth a child and for the record her nurse had some strange looking eyes, and then she birthed the baby but husband was still alive and he was saying his dad had a dumb name and then he died and then there was a small child driving a vehicle but his hair was a lot blonder than his eyebrows which always throws me off and something about his mom being gone and there was someone talking from the speakers in the car and did you know his phone was a nokia? but also, I don't think the policeman was a human and then the small child was hanging off of a cliff but he didn't die and then he said his name was that dumb name but then I was confused because his name was actually Jim and then I was mostly just confused. So you see, it was going so well for me. But then my mom came in about a third of the way through the movie and so she had no idea what was going on, but then my aunt started explaining it to her. I stopped watching the movie and started listening to her. And it was pretty interesting except I had no idea how she had figured all that stuff out. Something about time travel and planets exploding and multiple Spocks, etc. Then we had to leave and I never saw the rest of the movie. So then last night we decide to watch Star Trek. I was lucky, because I had just heard this whole explanation a couple of weeks before. So, using that information, I was able to follow along and pick up clues that fit into my aunt's explanation and guys. It was pretty neat. And, it was a really good movie because it made sense. I really, really liked it. In fact, I wouldn't mind watching it again someday because it was that good. They should make another one! 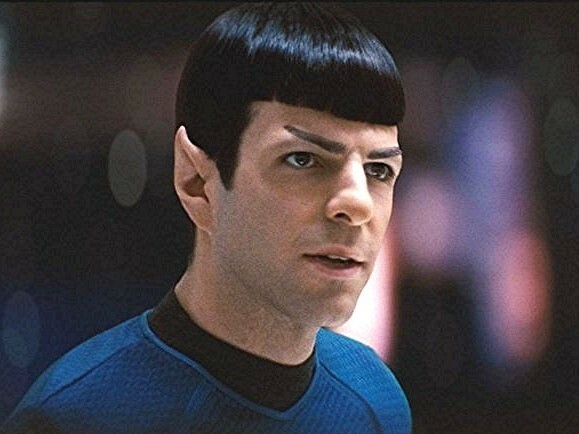 Also, don't tell anyone, but I kind of think Spock is strangely attractive. Is that weird? I mean, those ears and eyebrows really did something for him. Ha, but really. He's sort of adorable. "I'll be monitoring your frequencies."